Invoicing is something that most businesses do from time to time. Even if most of your business is completely automated, for example as an online store. You will eventually get someone who wants you to invoice them for the goods that they are wanting to purchase. Invoicing is essentially a request for payment to the customer. 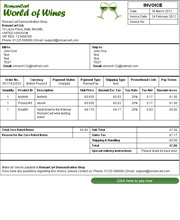 Some merchants will request that the invoice is paid before dispatch, or some will dispatch the goods but require payment within a certiain timescale. In the UK, invoicing when you are VAT registered carries extra responsibilities. If you use 'Standard Accounting' then when you raise an invoice you have to pay the VAT on the invoice to the VAT man in the next VAT return. Even if you have not actually received the payment from the customer! If you use 'Cash Accounting' then you pay the VAT when the customer has paid the invoice. If you are using 'Standard Accounting' but do not want to pay VAT when an invoice is raised, then the solution is to raise (create!) a Pro-Forma invoice. This is essentially the same as an invoice, but is not an official invoice and so does not carry the tax requirements. On the Sellr system, when a Pro-Forma Invoice is paid then it creates a Paid invoice at the same time. In the US Pro-Forma invoices are commonly called 'Quotes'. Using the Sellr system, you can invoice pre-defined contacts or simply create invoices to new contacts on the fly. You can have the invoice include a 'Pay' button, so when it is emailed to the recipient, they can simply click on the button to pay the invoice. And of course, the invoices are all easily viewed in the Sellr Sales Manager, where you can see your income from all the different channels you are using to Sell. Your website, eBay, the Sellr Marketplace, ePos, Google Shopping, Invoices, Pro Formas, Quotes, Telephone Orders, Mail Order Sales, App Sales and anywhere else you are selling your items or services.